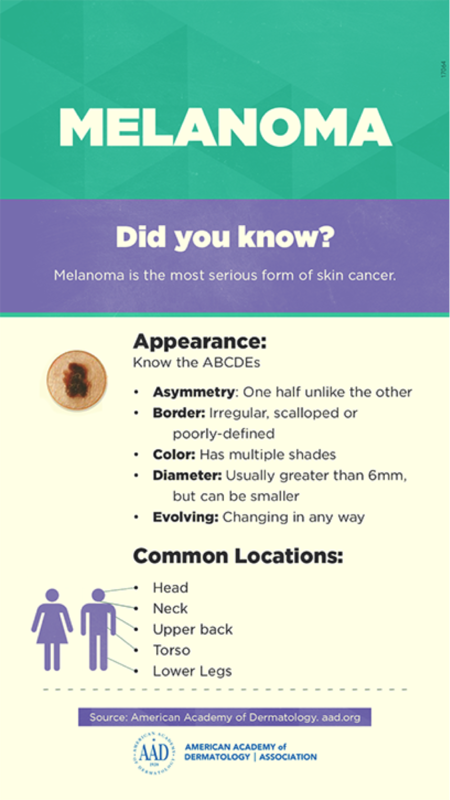 Malignant melanoma is the third most common skin cancer and the most dangerous. 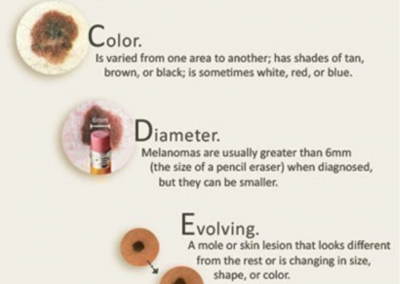 Melanoma originates from the cells in the skin that produce pigment (color) called melanocytes. For this reason, most melanomas are usually brown, black or dark blue in color, however, some melanomas may be tan, pink or red. Untreated melanoma has a high propensity to metastasize to your lymph nodes, liver, lungs, and brain. However, with early detection and treatment, most lesions can be cured. A skin exam by one of Front Range Dermatology Associates’ highly trained providers is a great step in preventing life-threatening melanoma skin cancer. Call today to schedule. Melanoma is triggered by damage done by ultraviolet (UV) radiation either from the sun or tanning beds. 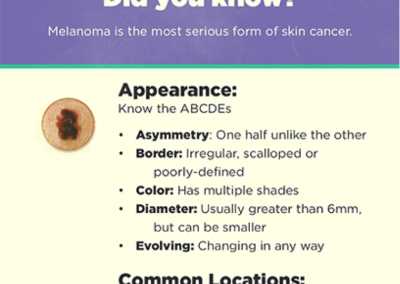 Who Is at Risk for Getting a Malignant Melanoma? Chronic sun exposure/sunburns – this includes recreational exposure (hiking, golf, swimming), use of tanning beds or exposure in occupations that are outside (lifeguards, farmers, ranchers, oil riggers). A history of having more than 5 blistering sunburns in childhood. If you are over the age of 65 your risk increases for a malignant melanoma, but this type of cancer can occur at any age. If you have fair skin or freckled skin. If you have light-colored eyes (blue, green or grey eyes). If you have blonde or red hair. If you have dysplastic nevus syndrome. Increased number of moles, especially over 50 throughout the body. You have been diagnosed with a previous melanoma. Immunosuppression- HIV patients, organ transplant patients or on medications that suppress the immune system. The good news is malignant melanoma can often be effectively managed by one of the following treatments. Surgery +/- Removal of lymph nodes. Chemotherapy Dacarbazine (also called DTIC), Temozolomide, Nab-paclitaxel, Paclitaxel, Cisplatin, Carboplatin or Vinblastine. Vaccine therapy Talimogene laherparepvec (Imlygic). Biologic, immune checkpoint inhibitors and targeted therapies like Ipilimumab (Yervoy®), vemurafenib (Zelboraf®),dabrafenib (Tafinlar®), trametinib (Mekinist®), nivolumab (Opdivo®) and pembrolizumab (Keytruda®) interferon-alfa and interleukin-2 (IL-2). If you have numerous moles monitoring them with total body photography. Protect you skin from UV rays with sunscreen, hats, sun-glasses and sun protective clothing. There is a new growth on your skin, especially if it is pigmented. You notice a changing lesion or spot, especially if change is rapid. You have a lesion or spot that is red, rough or scaly. You have a non-healing spot that bleeds with minor trauma. You have a lesion or spot that is painful or itchy. If you have a dark line under a finger or toenail. 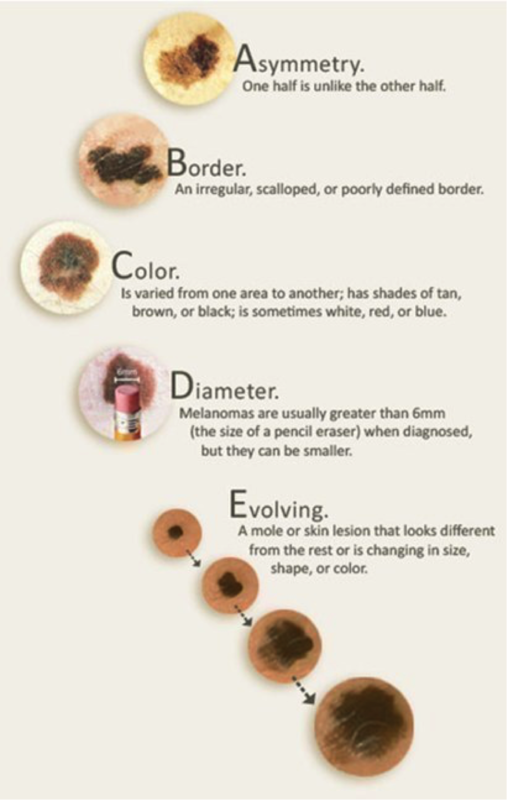 During your personal skin exam you notice a spot that displays the warning ABCDE’s of melanoma. To receive a thorough skin exam or receive treatment for your malignant melanoma, contact Front Range Dermatology Associate’s award-winning team by submitting the form below.